There’s nothing you love more than spending time with your grandchildren – they always make you laugh and smile. But when you do, you feel embarrassed about a blank spot in your smile. You’ve been missing a tooth for way too long but, you don’t want dentures, and you’re not sure where to start with dental implants in Toledo. You want to know exactly what they are, as well as what the process for them is like. Who can you trust to give you the professional perspective you need? The team at Dental Group West shares their expertise in this post – they’ll teach you all about dental implants here. 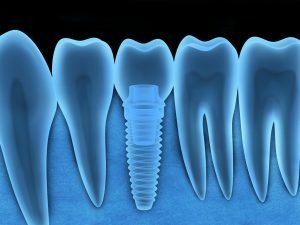 Implant – The implant itself is a biocompatible titanium post that will be surgically placed in your jaw. This will become the secure foundation for the rest of your replacement tooth. You’ll have oral surgery as the first step in the process, and you’ll need about 3-6 months for the post to fuse with your jaw in a process called osseointegration. At that point, the other pieces can be added. Abutment – This is the connecting piece between the implant and- the tooth-shaped “cap.” Once the implant is strong enough, the abutment will then be affixed to the post. Crown – This is the part of the replacement that looks like the tooth. The long-lasting, natural-looking porcelain dental crown will be secured to the abutment after that part is added, restoring your smile to its former glory. Stay-Put Smile – Who wants to put their smile in a cup at night? You won’t have to worry about the embarrassment of removeable dentures in your daily life, even when you kiss your sweetheart. And, you can say goodbye to messy dental adhesives, too. Now that you know what dental implants are, what the process is for them, and how much better they are than other replacement options, schedule your appointment with Dental Group West today and make your smile healthy and bright again!